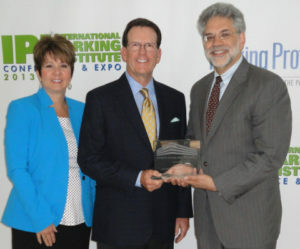 FORT LAUDERDALE, Fla.–(BUSINESS WIRE)–The Green Parking Council (GPC), which represents more than 31 prominent companies committed to pursuing environmentally beneficial choices in the parking industry, honored TransCore with one of its 2013 Leadership Awards recognizing the company’s participation in the growth of the Green Parking Council. The “Green Calculator” is an online tool to estimate carbon dioxide output at parking facilities by assessing traffic volume and average vehicle idle time. TransCore introduced the advanced Green Calculator during IPI’s annual meeting so parking authorities and institutions could more directly evaluate the current state of their parking facility’s environmental impact. The calculator can be accessed here. “Throughout the world, college, corporate, and medical institutions as well as parking operators are increasingly aware of their responsibility to make technology choices for their facilities that reduce their carbon footprint and support responsible corporate citizenship,” said David Tilley, TransCore’s Director of RFID Parking Solutions, North America. Wireless radio frequency identification (RFID) technology used for parking and access control, and also deployed for wireless payment of tolls throughout the country, allows vehicles to enter and exit parking garages virtually without stopping. By reducing idle times and significantly decreasing carbon emission output on a consistent basis can decrease idle times by an estimated 25-30 percent. The Green Calculator helps parking facility owners and managers quickly assess their facility’s emissions environment and make strategic decisions regarding access control technology that can improve air quality levels. The Green Parking Council is a national 501(c)(3) organization developing and dispersing green parking practices in and around the parking industry. GPC promotes certification and credentialing, open-sourced standards, professional leadership. GPC works at the intersection of parking, green building, clean technology, renewable energy, smart grid infrastructure, urban planning and sustainable mobility. TransCore’s 75-year heritage supporting the transportation industry dates back to the development of RFID transportation applications at Los Alamos National Labs to implementation of the nation’s first electronic toll collection system. The breadth of the company’s expertise includes traffic management systems, intelligent transportation systems (ITS), toll systems, integration, design consulting, operations, and maintenance. TransCore operates as a wholly owned subsidiary of Roper Industries and has installations in 46 countries and a vast portfolio of intellectual property. In 2012, Engineering News-Record (ENR) ranked TransCore No. 140 out of the Top 500 Design Firms. Also in 2013, TransCore received the International Road Federation’s Global Achievement Award as well as ITS New York’s Most Outstanding ITS Project of the Year award for New York City’s Midtown in Motion. For more information, visit www.transcore.com.